There are many variations, from pocket sized to life-sized, from very cheap plastic sets to very expensive antique collector's items. The standard sets we use in school and are the ones used in official tournaments are fortunately not expensive. There are various combos available for example at chesshouse.com http://www.chesshouse.com/club_chess_sets_s/162.htm. Some similar and a few various other options are here: http://www.wholesalechess.com/shop/chess_sets/club_chess_sets. Rick Knowlton, local chess coach, has a great website that shows all kinds of chess sets, describes the history of chess, and has all kinds of neat chess sets for sale. His site is www.ancientchess.com. Here's a direct link to the history of chess, with cool pictures of old chess sets: http://www.ancientchess.com/page/01.htm Did you know the piece we now call the bishop was originally an elephant? Did you know the queen wasn't always such a powerful piece? 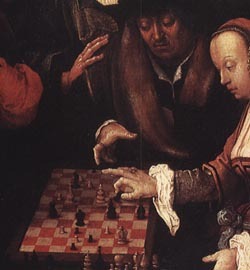 Did you know that they used to play chess on a board with 8 x 12 squares? !